The little boy pressed his nose up against the minivan window, twisting himself up under his seatbelt. He strained his one eye, trying to peer all the way across the golden field littered with shiny white unicorns, gamboling and playing, their manes rippling in the wind. Danny was sure that if his parents would just let him roll down the window so he could stick his head out, he’d be able to make out a moose in the forest edge beyond. Instead, all he could see was stupid unicorns. “We’re supposed to stay on the road,” his dad answered from the front seat. Danny’s whining, though, caused his mother to look back from the passenger seat in the front to check on him. “Sit up straight,” she said. “Your seatbelt won’t do you any good twisted up like that.” Although, she knew it didn’t really matter with how slow they were driving on this safari track. For months, Danny had begged and begged and begged to be taken on a drive-thru safari for his birthday. Now that they were here, all he could do was whine about moose. In the backseat, Danny slumped down, not even bothering to look out the window any more. He pulled his beloved mythology book out of the seat pocket in front of him and flipped to the page about the magical mystical moose. Danny traced his finger along the majestic curves of the moose’s broad antlers. So elegant. So amazing. He peeked out the window again and sneered at the pathetic unicorn horns. Those simple spikes were nothing to the beautiful branching of a moose’s antlers. Danny closed his eye and started singing the song he’d learned in school about moose. His mother sighed. Danny didn’t want to see the faeries, but he opened his eye and looked out the window anyway. Dainty sprites with iridescent wings and silver tresses flew among the trees and danced tiny waltzes in the middle of toadstool rings. At least, they were driving through the trees now, but Danny still didn’t see any moose. Danny held up his book, open to the gorgeous drawing of the moose, his favorite picture in the whole world. Danny was mad and felt like crying. 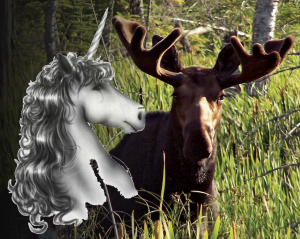 He’d come all this way to see a moose, and now his mother was telling him they didn’t exist? He flipped to another page in the book, hoping to make some amends out of this trip. “What about this one?” he said. He flipped to the picture of the bushy-tailed squirrels. Maybe the trip wouldn’t be a complete loss if he could just see one of them. But his mother shook her head. She rambled on for a while about how faeries gathered tufts of shed yeti fur to make their coats, but Danny wasn’t listening. He’d gone back to looking at the pictures in his mythology book, dreaming about a better world. When he got to the last page, Danny placed his index and middle finger on the two eyes of the creature labeled human. He knew what his birthday wish would be this year, when they got back home and he blew out the candles on his cake. He would wish he could live in a fabulous world with moose and squirrels, have two eyes instead of his one, and be a human.